Not quite two years ago, I had a conversation with a very knowledgeable and kind punk historian about the intersections of punk and women’s music. 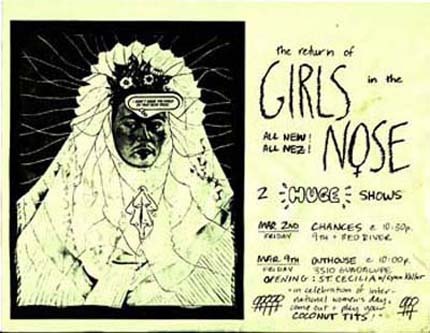 While many punk women did not identify as feminists, women’s music influenced the sounds they incorporated into their work, he told me– they brought in narratives and noises (both vocal and instrumental) that varied from more traditional forms of rock and punk. Their variations created a distinctly feminine and powerful method of punk (or post-punk) expression. Not confined to this genre, the female noize podcast moves from Australian rockabilly to British new wave to ’90s queercore to contemporary pop punk. The interpretation of noise here is not confined to the yelping and hollering of first-wave punk, post-punk, and no wave; it draws from other forms of noise that become politicized by moving beyond the expected realm of “feminine” sounds. It showcases orgasmic noises, angry yells, vocal hiccups, non-traditional instrumentation, and walls of static and feedback. For further listening, check out TV Dinner, Gunilla Mixtapes, A Reference of Female-Fronted Punk Rock, and Maximum Rocknroll Radio. Questions can be directed to puzzlepiecesrecords [at] gmail [dot] com. Catherine Humphreville also goes by Peyton and splits her time between a reproductive rights organization, Bluestockings Bookstore, puzzle pieces records, and acting like a middle child to anyone she encounters.